No, not even whether, only when. 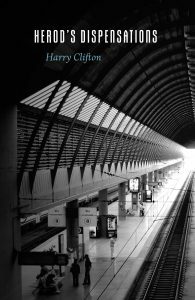 In addition to poetry, Clifton has written prose and short fiction. He also served as Ireland Professor of Poetry from 2010–2013. He was born in Dublin though he has lived in places throughout Europe, Africa, and Asia. He currently lives in Dublin with his wife, Irish novelist Deirdre Madden. Herod’s Dispensations will be published on March 1, 2019 and is now available for pre-order!